The second half of 2000 was rocky for Apple. Slower sales (both for Apple and the industry as a whole), combined with a misunderstanding of the consumer market resulted in the first unprofitable quarter in three years. One factor in this decline was the G4 Cube, which sold poorly due primarily to its high price compared to Apple's other products. Another factor was Apple's decision to include DVD-ROM drives in their consumer and professional machines instead of CD-RW drives. As a result, Apple missed sales opportunities to customers who wanted to burn their own CDs. Apple began to rectify these problems in late 2000, when it cut prices on the entire PowerMac line. Apple took the next step in January of 2001, when it announced a new line of PowerMacs, with either CD-RW drives or a new "SuperDrive" which could read and write both CDs and DVDs. Apple also announced two new application: iDVD, a DVD-authoring program, and iTunes, which allowed users to encode and listen to MP3 songs, and then burn them to CDs. All this was part of Apple's new corporate strategy, developed in the face of a massive slow down in the Technology industry: Apple would take advantage of the explosion of personal electronic devices--CD-players, MP3 players, digital cameras, DVD-players, etc.--by building Mac-only applications that added value to those devices. Just as iMovie had added tremendous value to Digital Cameras, iDVD would add value to Digital Cameras and to DVD-players, and iTunes would add value to CD and MP3 players. It was Apple's hope that making the Mac the "Digital Hub" of the new "Digital Lifestyle" would revitalize Apple's sales and guarantee the long-term security of the company. 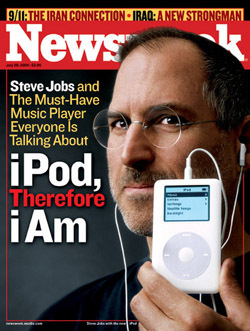 In May 2001, Steve Jobs announced that Apple would be opening a number of retail stores across America, selling not only Apple computers, but various third-party "digital lifestyle" products, such as mp3 players, digital still and video cameras, and PDAs. Apple also announced a major update to the iBook line, a smaller and lighter design that borrowed heavily from the PowerBook G4. In July, Apple refreshed iMacs and G4, and "suspended production" of the G4 Cube, ending months of speculation as to how Apple would deal with the Cube's resounding failure in the marketplace. The Fall of 2001 brought new revisions to the PowerBook G4 and iBook lines, the latter of which had sold extremely well during the summer. In late October, Apple announced its first non-computer product in several years, the iPod. The iPod was a small hard-drive-based digital music player, and represented Apple's first hardware addition to its "digital hub" strategy. At $399, the iPod faced a similar challenge to the woeful G4 Cube: it favored style and form-factor over price. Apple was taking another gamble by charging a premium for the iPod's superior design and small size. In January 2002, Apple reinvented the consumer desktop, again, when it released its flat panel iMac. It also announced iPhoto, a new software package aimed at improving the digital camera user experience. Apple rolled through the first half of 2002, showing profits through the first two quarters. Apple stumbled in the second half of 2002, however, largely due to macroeconomic conditions. With fewer PC purchases being made, Apple scrambled to keep itself fresh in a shrinking marketplace. In June, Apple introduced its "Switchers" ad campain, which would grow to be one of the most popular and successfull of Apple's history. Based on non-scripted monologues of real people, the Switchers campain made the strongest case yet for Macs in a PC world. In July 2002, Steve Jobs announced that the free iTools service would be rolled into a new subscription-based "dotMac" service. Combined with the newly announced iCal and iSync, dotMac was aimed at futher centralizing the Mac in the high-tech lifestyle. In January 2003, Apple released iLife, a bundled software package that included iTunes, iPhoto, iMovie and iDVD, for $50. (all but iDVD could be freely downloaded from Apple's site), in a play to further push the digital-hub concept into the consumer space. Apple's financial troubles continued throughout 2002. In October, it announced a quarterly loss of $45 million, due to weak PowerBook and PowerMac sales. In 2003, however, Apple began to recover, and to build for the future. In January, Apple announced two new PowerBook G4 models, a 12" model similar to existing 12" iBooks, and a giant, wide-screen 17" model, aimed squarely at the graphic design market. Apple also announced that it would be shipping its own Web Browser, Safari, in an apparent attempt to depend less on Microsoft for what was widely believed to be an inferior product. The new PowerBooks sold well, and sales of flat panel iMacs remained steady, but Apple was still in trouble in the professional desktop market. Motorola's development and production of the G4-family of processors continued to lag well behind Apple's expectations. It appeared that the G4 processor had hit a dead end. Apple worked to remedy the situation by developing a new processor with IBM, and in June 2003 came to fruition with the release of the PowerMac G5. The G5 chip, based on IBM's Power4 chip, was a 64-bit processor, meaning it could address more memory and process larger numbers than its 32-bit G4 cousin. The PowerMac G5 represented a hugh shift for Apple, who redesigned the motherboard and case from scratch. Unlike the PowerMac G4, which was based strongly on existing G3 hardware, the G5 was all new, and fast. Though supplies were constrained, the G5 sold well and did much to improve Apple's bottom line. Meanwhile, the iPod was beginning to take off. In April of 2003, Apple unveiled the iTunes Music Store, which would sell individual songs through the iTunes application, for 99 cents each. These songs could be played only on Macs or iPods, but Apple felt that by offering an easy to use, no-nonsense music service, it could make significant inroads to the digital music market. Apple did their homework: when announced, the iTunes Music Store already had the backing of the five major record labels, and a catalog of more than 200,000 songs. In October 2003, Apple released iTunes for Windows. While the iPod had been available for Windows for some time, it had used third-party software which failed to provide the unique user experience that iTunes/iPod integration allowed. With the release of a stable, user-friendly Windows version of iTunes, which included both iPod and Music Store integration, Apple was poised to take the digital music industry by storm. Apple cemented its position with the January 2004 release of the iPod mini, which while smaller in capacity than the original iPod, was smaller than many cellphones. In the first year alone, the iTunes Music Store sold more than 70 million songs, and by July this number had increased to more than 100 million. The iTunes Music Store had a 70% market share among all legal online music download services. iPods had moved from expensive toys to must-have Christmas presents, and Apple found itself in the position of having a monopoly for the first time in several decades.